With great sadness, we announce the recent passing of “Ms Harmonica”, a special human being who had tremendous passions for music, people, and traveling around the world. Born Cecilia LoForti, Ms Harmonica artfully combined her love of harmonica, globe-trotting adventure, art, graphics, different cultures and the universal language of music to create a unique blog, known as thetravelingharmonica.com. Through this interesting and colorful project, she shared engaging stories and images from what she termed her “JamTrotting” musical adventures as she traveled to places near and far….always with her harmonica. Most of all, she shared her warm heart and love of music wherever she went. 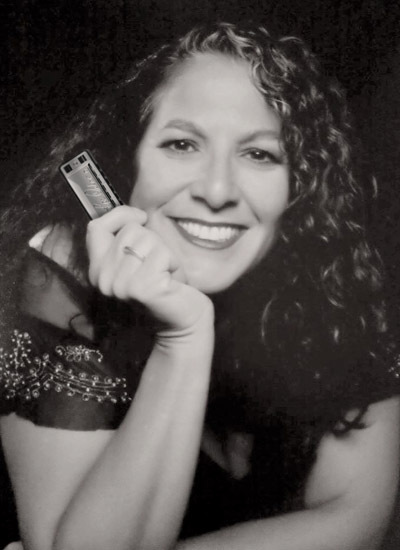 In fact, she was a big inspiration for our “For All, For Life” Campaign, which was built on the key idea that people of all ages and stages of life, backgrounds, musical abilities and preferences can enjoy playing many different genres of music on the harmonica, throughout their lifetimes. Ms Harmonica, we will miss your delightful presence. Rest in peace and harmony.